Last week Ixia announced the integration of their Application and Threat Intelligence Processor and our cyber threat incident response solution. Using IPFIX, or what Ixia calls Ixflow exports, this combined solution gives administrators additional ability to identify and track users, operating systems and applications that generate excessive traffic or security threats. Today, I wanted to follow up on that announcement and talk about how you configure this flow export which will increase your overall network and application visibility, and network threat forensics and incident response. I talk to customers all the time who are looking to leverage NetFlow or IPFIX to gain some visibility in to the traffic on their networks. But sometimes they find that the devices they have don’t support any kind of flow monitoring. Or maybe they have devices that support some kind of flow monitoring, but they don’t get the visibility that they really need. Whether you are looking to flow monitoring for network forensics and incident response, or general traffic visibility, you need insight into all areas of the network. Ixia’s network packet broker (NPB) is a device that directs network traffic from switch SPAN ports, taps, and/or between two connected routers and/or switches, and then manipulates that traffic by parsing and copying it to allow the more efficient use of network security and performance tools. Ixia brings a new level of intelligence to the network packet control and analysis. Distinct Application Fingerprints and dynamic identification capability for unknown applications give network managers a complete view of their networks, including application success and failure tracking. By combining rich contextual information such as geo-location of application usage, handset or device type, operating system and browser type, the Application and Threat Intelligence Processor helps to identify suspicious activity such as unauthorized BYOD usage or business connections from untrusted locations. So why is gathering this type of information important to your network monitoring needs? And all of this rich traffic insight can be exported in flow exports! Login to Ixia ATI Processor card settings via web interface. Now let’s take a look at some of the unique reporting that is available. Notice in the report below we can see the operating system, the host, the city and country, and how much traffic is being generated. You can filter these reports on any field element exported in the flow records, as well as any date/time window that might be of interest. Efficient traffic management requires usable and relevant information from all points on the network. Collecting IPFIX provides an efficient means to identify inappropriate behavior, problems and discrepancies. 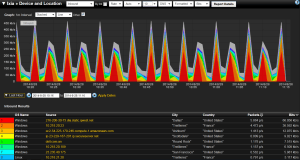 The ability to drill down to specifics makes incident response using IPFIX an invaluable tool for charting the health of your network. When security professionals need to go back in time and view a communication pattern, they can find the flows that contain the conversations that they want to investigate. Do you have blind spots, or visibility points on your network that you wish that you had richer traffic details? If the answer to this questions is yes, let us help you get this type of advanced flow monitoring set up.